One of the world’s most wanted pirate fishing ships, the FV Viking, has been dramatically scuttled by the Indonesian Navy, bringing more than a decade of toothfish poaching in the Southern Ocean to what authorities hope is a decisive end. 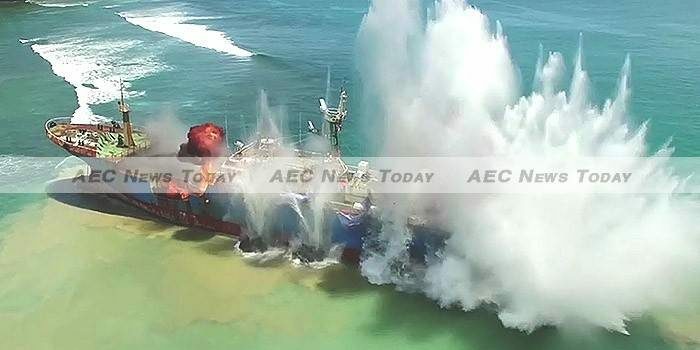 Spectacular drone footage of the sinking, released by marine conservation organisation The Sea Shepherd on YouTube on March 16, shows the Nigeria-flagged FV Viking being rocked by a controlled explosion. The blast splits the hull of the outlaw vessel open in several places, sending a plume of black smoke spiralling skyward before the FV Viking slowly begins to list in the clear blue waters of Pangandaran, West Java. The FV Viking is the last of half a dozen toothfish-poaching ships branded ‘The Bandit 6’ by Sea Shepherd, which hunted the boats as part of its Operation Icefish 2015-16 campaign and was among those who alerted Indonesian authorities when the vessel entered their waters. The Indonesian Navy seized the FV Viking on February 25 operating in the waters of Tanjung Berakit, in Riau Islands province, south of Singapore. It had been operating as a ‘ghost ship’, frequently changing its name and registry and broadcasting no satellite signal in order to avoid detection. The FV Viking was handed over to the IUU fishing taskforce at the Maritime Affairs and Fisheries Ministry to be destroyed. The ship’s 11 crew members — five from Argentina, Peru and Myanmar, plus six Indonesians — are awaiting charges of violating the Law on Shipping and the Law on Fisheries. The Indonesian government has taken a tough stance on illegal fishing since the 2014 election of President Joko ‘Jokowi’ Widodo, destroying about 150 foreign fishing boats. Last year Indonesia said the value of stolen marine fish, tax revenue and licensing fees by more than 3,000 Thai pirate fishing vessels alone costs it between US$1.2 billion and $2.4 billion each year. Patagonian toothfish, marketed as Chilean sea bass, is a popular dish in the United States. The species can reach up to 120kg (265 lb) in weight, with each fish fetching several thousand dollars. Siddharth Chakravarty, Sea Shepherd’s campaign leader, said of the FV Viking sinking: “I wish there were more governments standing up for what they can do within their legal instruments and not worry about how international diplomacy is going to play out after that.” He also noted that the FV Viking had been fishing for 13 years in Antarctica and spotted 18 times, but always managed to evade capture. The FV Viking’s sister ship, known as the Taishan or Kunlun, was detained by authorities in Thailand for six months before it fled with its cargo of 182 tons of toothfish, worth about $4.95 million last September (See: Thailand Launches Air & Sea Hunt For Rogue Fishing ship). It evaded a Royal Thai Navy (RTN) air and sea search and was finally detained in Senegal last month flying an Indonesian flag and renamed Asian Warrior.